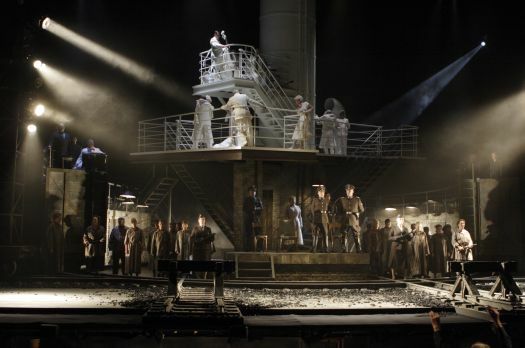 Weinberg's first opera, The Passenger was written in 1968 but had to wait until 2010 to receive its stage premiere, when this production by David Poutney debuted to great acclaim at the Bregenz Festival. Based on the experiences of Zofia Posmysz as recounted in her novel of the same name, The Passenger tells the story of two women, Marta and Liese, with very different and yet mutually entangled histories. The former was an SS prison guard at Auschwitz, where the latter spent time as a prisoner under Marta's aegis. The action takes place in two separate times. Marta and her West German diplomat husband Walter are sailing to Brazil fifteen years after the end of the war, when Marta realises that Liese is also on board, thus forcing her to confess her past to her husband, and, ultimately, to face Liese. These scenes largely frame the drama, with the bulk of the central action telling of the protagonists’ time at Auschwitz, although we are reminded at various points of Walter's growing horror as Marta narrates her story to him. David Poutney’s vivid and yet subtle staging is most effective in its observation of the shifts between these two scenarios, and in tonally contrasting and evoking each. Credit should also go to set designer Johan Engels' mobile hierarchical sets in this regard. The Passenger thus explores ideas of guilt, retribution, and personal responsibility in the context of collective actions, particularly as these things come to shift and settle over time. The subject of Nazi officials and the survivors of their aggression trying to make their way in the post-war world is obviously a potent one. Amongst many comparable works of drama, the recent book and film The Reader jumps most readily to mind as a comparison here. Both explicitly engage the process of Vergangenheitsbewältigung, and both depict their subject fairly unflinchingly, with a particular eye to the self-deceptions that took place in the mind of the perpetrators both during and after the war. So the subject is a potent one. And yet it is also coloured in this opera with an unrelenting grimness, and a portentous of tone and a glacial sense of pace, such that the piece has a tendency to drag, particularly in its opening scenes. However, a number of elements serve to counteract such an impression. The performances are realised with a universal depth of identification and feeling; Michelle Breedt was particularly strong in conveying Liese's genuine confusion in response to what she saw as the unjustified hatred coming from her prisoners, and in turn in showing how that confusion modulated subtly into cruelty. Kim Begley's Walter communicated a sternness shaded with complexity and compassion, whilst Leigh Melrose as Tadeusz (Marta’s doomed husband), although appearing too forceful, too defiant, at times, sang with easeful authority. Giselle Allen assumed the role of Marta. Although Breedt's voice is lacking some of the tonal richness of her partners in this production, sounding just a little colourless in the climaxes, her singing in the radiant A-major love scene with Tadeusz was sweet and glowing. More broadly, Allen caught the underlying strength and anguish of her character very well. Weinberg's musical conception, meanwhile, is rich, with the continuous arioso and the post-Straussian neo-classicism, and the debts to Britten and Shostakovich in terms of instrumentation, gesture, and design, giving way to various leavening elements. An unaccompanied Russian folk song stops the drama dead in the second half. A satirically buoyant round shared between SS officers is rich in gallows humour. A simple duet on the importance of learning French for when the singers are liberated, which is accompanied only by a xylophone, is moving in the extreme. Richard Armstrong's leadership in the pit brought out the varying colours and intensities of each character's music, with the jazzy clarinet and brushed snare drum, the bare oboe and bass clarinet, and the rushing, Brittenesque string motifs, being particularly evocative at each return. Armstrong also brought a real fervour to the brass explosions that underlay the crucial points of the drama. A powerful showing from all involved, then. The Passenger ends on a suitably unresolved note, both musically and dramatically, leaving the hall resonating with a certain plea that became all the more moving when the author herself came on stage to take hr bow at the end. 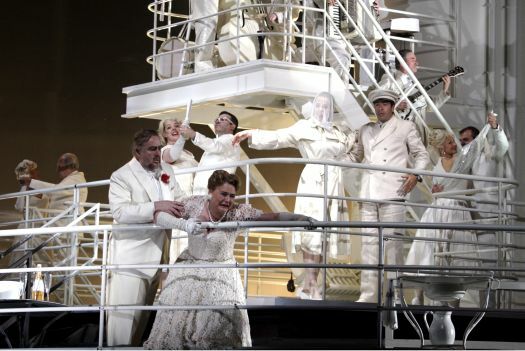 Despite its occasional portentousness, then, The Passenger deserves the heavy plaudits being heaped on it; unlike other so-called 'lost' operas, this one proves to be worth it.